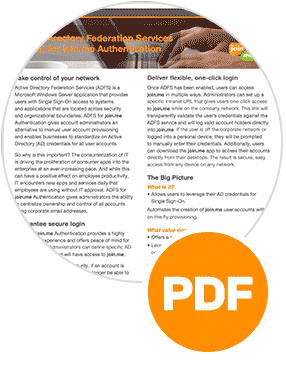 Take control of your network, guarantee secure login, and deliver flexible, one-click login with ADFS for join.me. Take control of your network. Active Directory Federation Services (ADFS) is a Microsoft Windows Server application that provides users with Single Sign-On access to systems and applications that are located across security and organizational boundaries. ADFS for join.me Authentication gives account administrators an alternative to manual user account provisioning and enables businesses to standardize on Active Directory (AD) credentials for all user accounts. So why is this important? The consumerization of IT is driving the proliferation of consumer apps into the enterprise at an ever-increasing pace. And while this can have a positive effect on employee productivity, IT encounters new apps and services daily that employees are using without IT approval. ADFS for join.me Authentication gives administrators the ability to centralize ownership and control of all accounts using corporate email addresses. Guarantee secure login. ADFS for join.me Authentication provides a highly secure user experience and offers peace of mind for administrators. Administrators can define specific AD groups and users that will have access to join.me. And as an added layer of security, if an account is removed from AD, that user will no longer be able to access join.me. 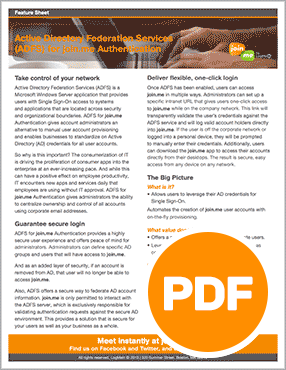 Also, ADFS offers a secure way to federate AD account information. join.me is only permitted to interact with the ADFS server, which is exclusively responsible for validating authentication requests against the secure AD environment. This provides a solution that is secure for your users as well as your business as a whole. Deliver flexible, one-click login. Once ADFS has been enabled, users can access join.me in multiple ways. Administrators can set up a specific intranet URL that gives users one-click access to join.me while on the company network. This link will transparently validate the user’s credentials against the ADFS service and will log valid account holders directly into join.me. If the user is off the corporate network or logged into a personal device, they will be prompted to manually enter their credentials. Additionally, users can download the join.me app to access their accounts directly from their desktops. The result is secure, easy access from any device on any network. What is it? Allows users to leverage their AD credentials for Single Sign-On, and automates the creation of join.me user accounts with on-the-fly provisioning. What value does it offer? Offers a secure and easy way to authenticate users and leverages AD credentials for all user accounts, as opposed to user-defined credentials. Who should use it? 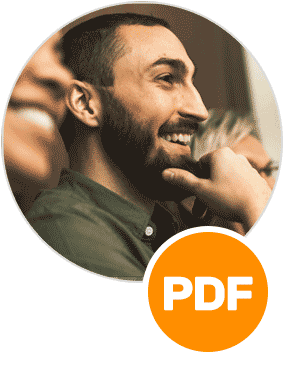 Ideal for anyone who uses AD to manage user account information or needs a secure way to manage employee software access.